England 136 and 2-24 (Alastair Cook 11*, Kevin Pietersen 3, Mitchell Johnson 1-7) trails Australia 295 and 7-401 (David Warner 124, Michael Clarke 113, Brad Haddin 53, Chris Tremlett 3-69) by 537 runs with eight wickets in hand. The Australian skipper, Michael Clarke, along with David Warner plundered centuries and put their team on top against the visiting England in the opening Test. The Kangaroos scored 295 in their first innings and declared the second at 7-401. 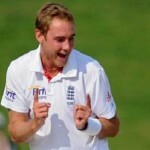 The Englishmen managed 136 in the first innings and were reeling at 2-24 in 15 overs in the second. The third day’s play concluded on Saturday, November 23, 2013, at Brisbane Cricket Ground, Woolloongabba, Brisbane. Earlier, the Aussies started the day at 0-65 after 22 overs whereas David Warner and Chris Rogers were unbeaten for 45 and 15. 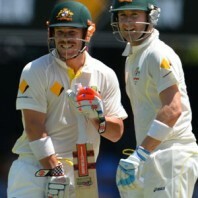 The latter was gone in the second over for 16 and Shane Watson became the next victim at 75 after scoring just 6 runs. Michael Clarke stepped in next and got off smartly as Warner went past his fifty. The duo kept on playing their shots at will and lunch was taken at 2-145 in 45 overs. 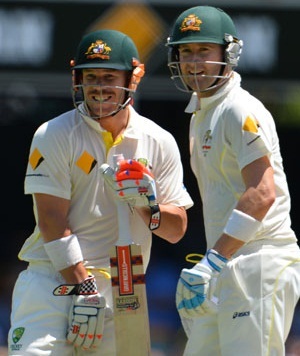 Clarke reached his fifty in the process and David Warner smashed his fourth Test hundred. The pair enhanced the score to 233 when Warner left the scene for 124 and Michael Clarke registered his 25th Test century. The latter was dismissed for 113 and the lower order contributed valuable runs. Brad Haddin scored his second fifty of the innings and went back to the pavilion for 53. Mitchell Johnson and Peter Siddle secured their ends for 39 and 4 and the innings of the Kangaroos was declared at 7-401 in 94 overs. Chris Tremlett was the highest wicket taker with three whereas Stuart Broad and Graeme Swann shared two each. The visitors required a difficult target of 561 to win the game but had a dismal beginning of their second innings by losing their two top order batsmen for 10 mere runs. Alastair Cook and Kevin Pietersen saw the day off with 11 and 3 as their team reached 2-24 in 15 overs. 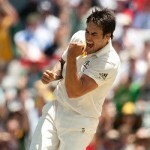 Ryan Harris and Mitchell Johnson made the initial dent in the rival batting by claiming one wicket each. England still requires another 537 runs to win the encounter but Australia is on the driving seat and might clinch the match on the fourth day.